We didn’t have much of a summer in Milan this year, with a lot of rain and cooler than usual temperatures, but then Summer paid us a visit in early September. The sun was shining, the temperatures rose, it was like July had decided to show up, better late than never. As much as I appreciated the warm weather, a small part of me was anxiously awaiting the arrival of fall. When I left the house on Thursday, I could feel the autumn breeze in the air and it put a smile on my face. Something about this time of year is magical for me. The seasons collide and beauty happens. I love the fall season for so many reasons, the crisp fresh air, chunky sweaters and warm cozy socks, pumpkins, squash, apples and figs, the changing colours of the leaves, and the feeling of a new beginning. Autumn has always represented the start of something new to me, much more so than Spring or the New Year itself. Perhaps it dates back to the beginning of a new school year every September, with back to school shopping and a new wardrobe. When this time of year rolls around, I feel rejuvenated and ready to take on the world more so than any other time of year. As summer transitions to fall, the market stands are adorned with late summer and early autumn vegetables living in harmony. The colours are beautiful and the combinations and permutations for delicious meals are endless. 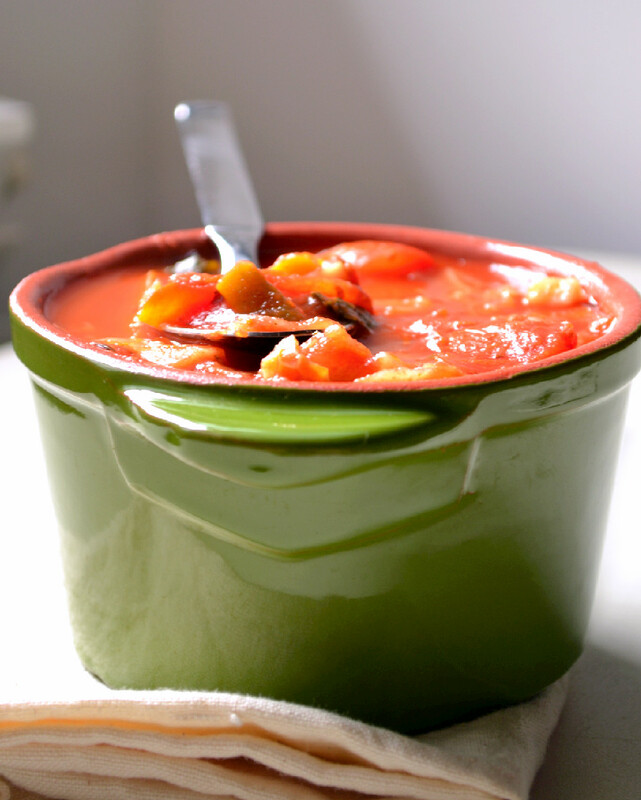 This Hearty Tomato Vegetable stew is one such example of what happens when summer and autumn collide in our refrigerator. It’s light yet satisfying, warming, and absolutely perfect for a late summer/early autumn evening. Best of all, it’s simple enough to whip up for a weeknight dinner and the vegetables can be easily substituted with what you have on hand at the moment. On this last day of Summer, let’s celebrate the best of both seasons in harmonious union. Warm EVOO in a large pot over medium heat. Sautee onions in EVOO, with a pinch of fine sea salt over medium heat for about 2-3 minutes until softened. Add pressed garlic and sautee for another minute or two. Stir in green beans and carrots and cook for 2-3 minutes. 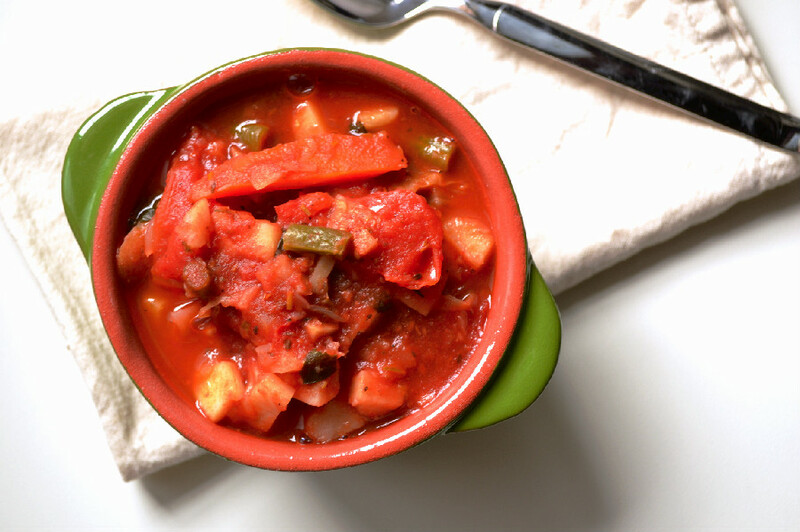 Add tomatoes, sweet white potatoes, tomato puree and water and let simmer on low heat for about 15 minutes until all of the vegetables are tender. Add herbs and spices and savoy cabbage and continue to simmer for another 10 minutes on low heat. 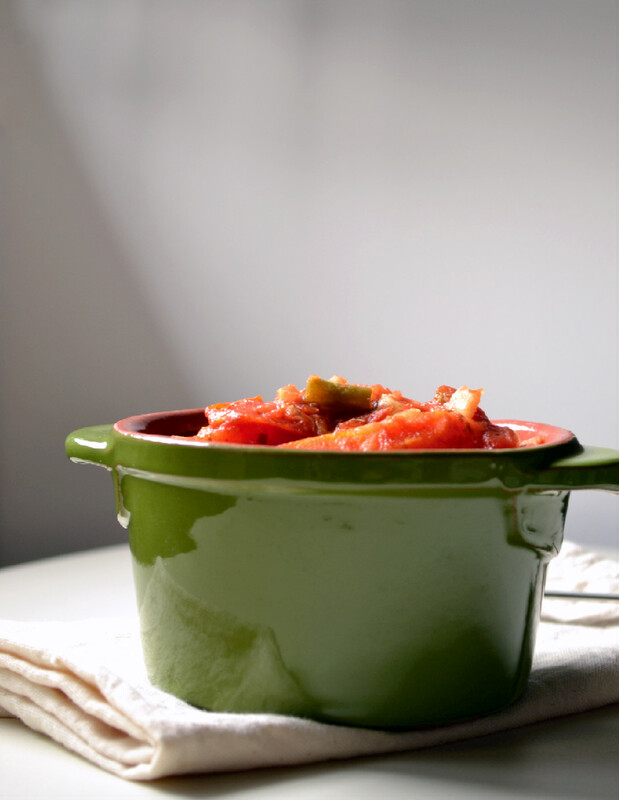 Check vegetables for readiness, they should be tender and soft but not mushy. 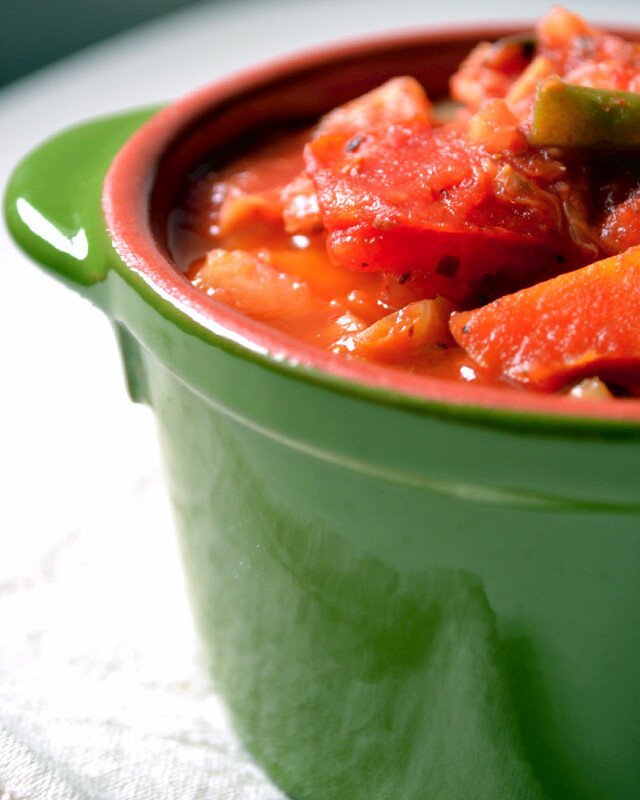 If you like your vegetables really soft, you can cook let it simmer an additional 10 minutes. Adjust seasoning to taste, and remove from heat. Stir in chopped parsley and serve while steamy. Store leftovers in an airtight container in the refrigerator. The flavours will be even better the next day. Tip: This can also be pureed with an immersion blender and served as a thick soup. I made this for dinner last Thursday and it was too dark to get good photographs, so that’s why you don’t see the fresh ingredient shots I usually like to include in my posts. I shot the leftovers the next day as I heated this up for lunch. I must say it tasted even better, as the flavours really came together overnight.